WASHINGTON | Supreme Court nominee Brett Kavanaugh said Tuesday that he views Roe v. Wade as settled law, according to Sen. Susan Collins of Maine, but the answer did not pacify Democrats who say he would restrict abortion access from the bench. Kavanaugh told Collins that he agrees with Chief Justice John Roberts, who called Roe v. Wade settled law during his 2005 confirmation hearings. 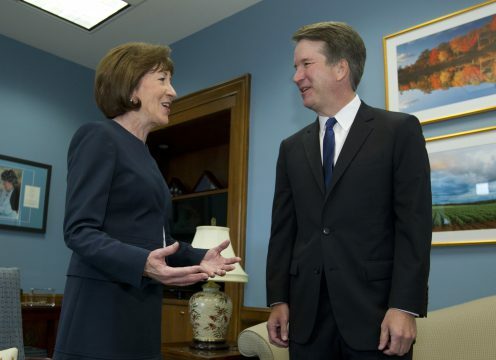 “We talked at great length about precedent and the application of stare decisis to abortion cases,” Collins said, using the legal term for settled precedent. Kavanaugh had vowed to oppose President Donald Trump’s nominee if he had “demonstrated hostility” to the 1973 decision codifying abortion rights. Collins called the meeting “very informative” and said they discussed a variety of topics. She does not plan to make a decision on how to vote until after the Senate Judiciary Committee holds confirmation hearings for Kavanaugh, set for next month. Kavanaugh has already met with most Senate Republicans, but winning support from Collins and Sen. Lisa Murkowski, R-Alaska, could be crucial. Both senators support access to abortion services. Republicans maintain a narrow 50-49 majority in the Senate due to the absence of ailing Sen. John McCain, R-Ariz., and can’t afford a single defection on Kavanaugh if every Democrat votes no. Democrats have complained that Republicans are withholding documents in their rush to confirm Trump’s pick for the court ahead of the midterm elections. They want access to records that crossed Kavanaugh’s desk as Bush’s staff secretary. But Republicans have declined to pursue them, saying there are adequate records available from Kavanaugh’s previous administrative work, including 12 years as an appellate court justice. The National Archives is also producing documents from Kavanaugh’s time serving during Kenneth Starr’s investigation of President Bill Clinton, but has said its larger cache of files from the Bush years won’t fully be delivered until later this year.